we are attached the official Recruitment Notification at the end of this article. As per Recruitment Notification for this Can Fin Homes Probationary Assistants Posts candidates must have qualified Degree from any recognized university and should have knowledge in computers usage. 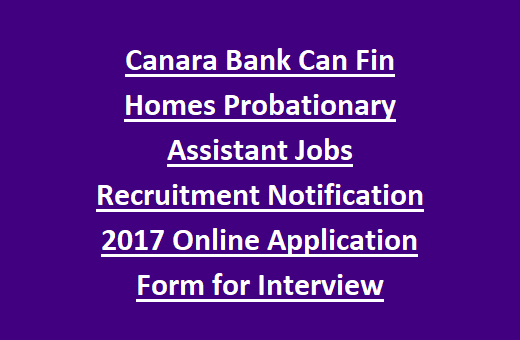 Last date for submission of application form online for this Can Fin Homes Ltd Probationary Assistant Jobs of Clerical Cadre is 14-08-2017. Online application is already started on 07-08-2017. Probationary Assistants jobs applications will be accepted through Can Fin Homes official web site of www.canfinhomes.com. Selection for these vacancies will be held through merit in educational qualifications and personal interview. For more details about this Canfin homes Probationary Assistant jobs see the details given below. There are total 30 Probationary Assistant vacancies in this Canfin Homes ltd Recruitment. Candidate must have Degree qualification and knowledge of data entry or computer applications is required. Must have known the local language for which he/she is going to apply. Application fee is Rs.100/- candidates can pay the fee through online or offline. For offline payment candidate have to deposit the amount in any Canarabank branches to the credit of"Can Fin Homes ltd" Current Account no-0684201001486, Canara Bank, Lalbagh West Branch, Bangalore IFSC Code: CNRB0000684 and must scan and upload the counter foil at the time online application form. Selected candidates have to work under probation for at least one year and based on satisfactory probationary period will be removed or extended after one year. Initially based on received applications in 1:5 ration candidates will be Called for interview. Based on candidates performance interview final list will be prepared. 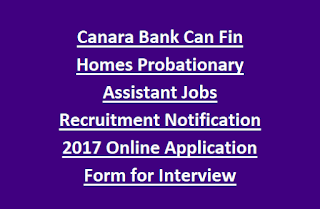 Eligible candidates can apply online for this Probationary Assistant jobs online only through the official website of www.canfinhomes.com on or before 14-08-2017.